For the second year in a row, the top-ranked Army ROTC Cadet in the nation is a Green to Gold 4-year-scholarship winner! 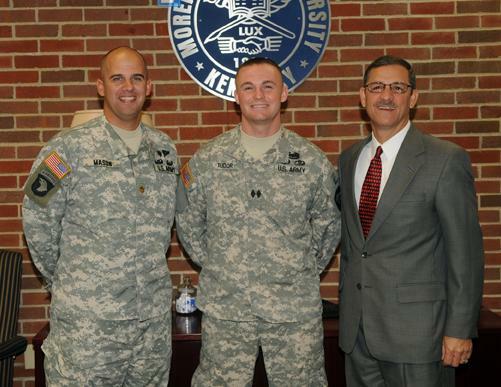 Major Robert A. Mason, professor of military science, Cadet Wesley Tudor and Dr. Wayne Andrews, MSU president, from left. Wesley Tudor of LaPort, Indiana was recognized at Morehead State University for being the top cadet on the national order of merit list. The senior and cadet battalion commander ranked first on a national ranking including 5,342 Army ROTC cadets. 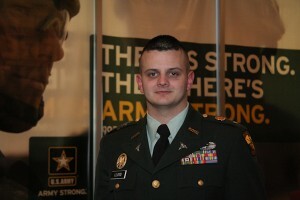 Wesley identified himself as a four-year Green to Gold scholarship Cadet on his first Army Strong Stories blog after completing LDAC over the summer of 2010. He will commission this May as an active duty Second Lieutenant in the Finance Corps. This is not the first year that a Green to Gold Cadet has been ranked number one on the national order of merit list. Last year (2009), Cadet Erik Lloyd, a graduate of Indiana University of Pennsylvania, was ranked the number one cadet in the nation. Lloyd was an Active Duty Option Green to Gold cadet, and is now a Medical Service Officer. Thank you Green to Gold cadets for continuing this legacy of excellence! This entry was posted in Announcements and tagged Active Duty Option, ADO, G2G, Green to Gold, Indiana University of Pennsylvania, Morehead State University, Reserve Officers Training Corp. Bookmark the permalink.